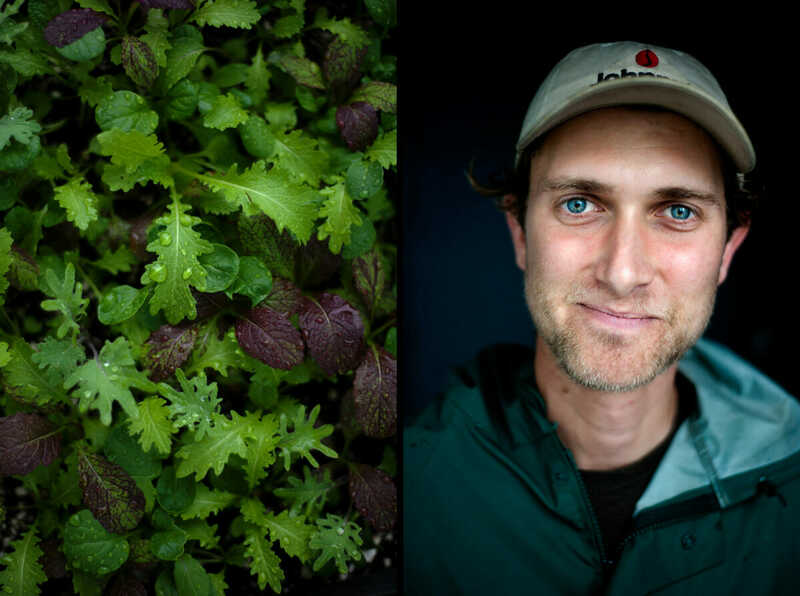 Pickens (who I knew from our time together attending Ohio University) meets regularly with the restaurant’s chef and the farm’s founder Sisha OrtÁºzar to discuss what’s growing and what to plant next season. I was able to spend a couple of days photographing the milk crate farm, while Pickens showed off some of his flavorful plants and filled me in on how he came to be a farmer in the middle of Manhattan. Modern Farmer: How did you become a farmer? ZP: I grew up in a semi-rural part of Ohio with parents and grandparents who kept gardens, but I wasn’t interested in agriculture until I moved to New York in 2007. My wife and I started a garden on our building’s roof that first year, and it produced next to nothing. 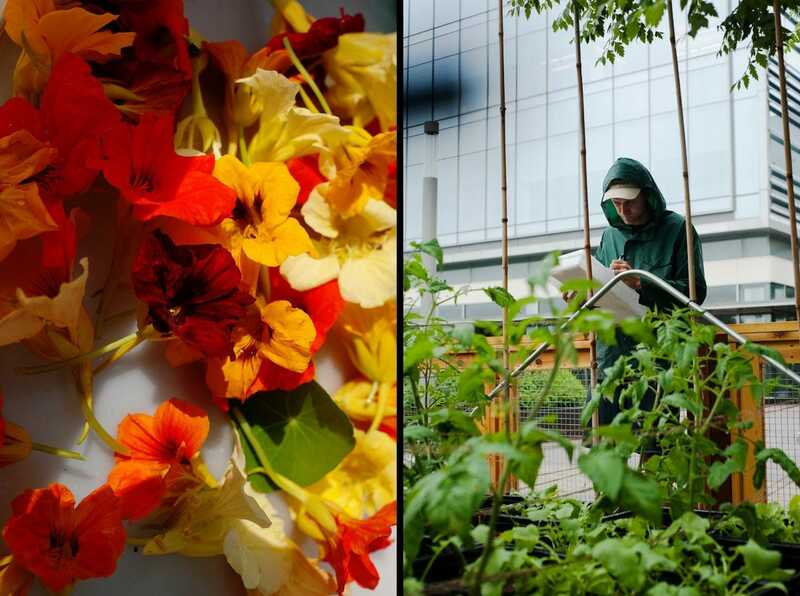 The hobby quickly turned into an interesting challenge for me, and I dove into figuring out how I could grow food well in the city. I started reading a lot, asking a lot of questions, volunteering, taking classes, and aligned myself with like-minded people. I was also interested in sharing that knowledge with adults and children in New York, some of whom had never even seen a carrot in the ground. I helped start two school garden programs, worked on an urban farm with high school students, and managed youth-run farmers markets. 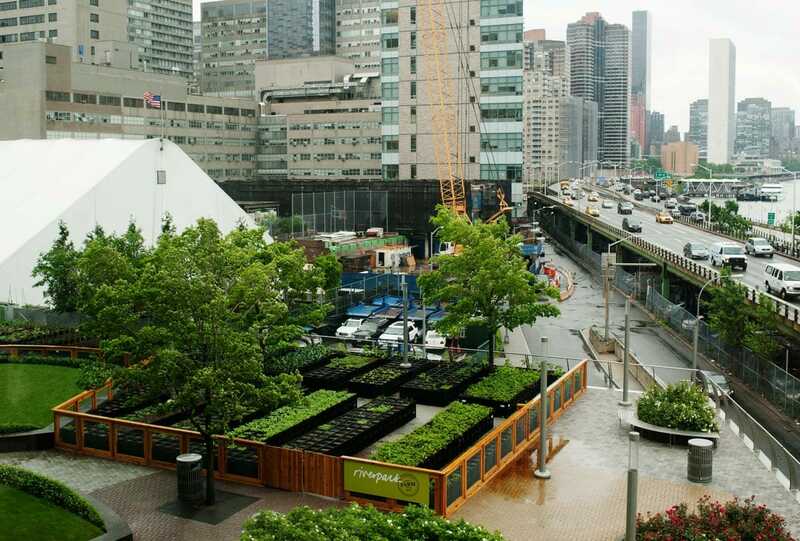 I started a seed company and launched a rooftop garden on top of Madiba Restaurant in Fort Greene, Brooklyn. The last two experiences led directly to my position at Riverpark Farm. 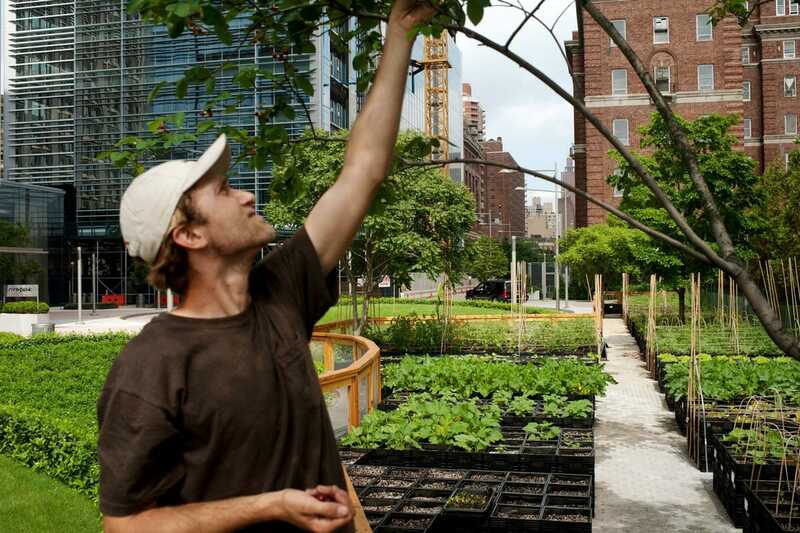 MF: What are the challenges of maintaining Riverpark Farm versus a conventional farm? ZP: Our system is pretty unique and there have definitely been steep learning curves season over season. For starters, our farm exists in milk crates and is portable and modular. So unlike a conventional farm, we can pick it up and move it within a couple of days and have done so three times. 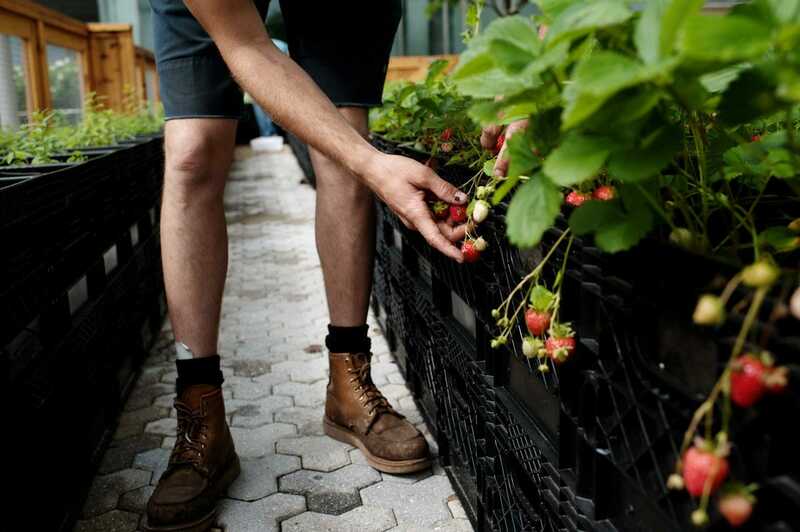 Because milk crates have substantial openings in their plastic on all sides, we have increased rates of evaporation and noticed a decrease in our soil’s water retention. We had to build up our potting mix, making it more dense with compost and bio-activity thus making it harder for the water to escape. Also, having 3,200 separate planter units to monitor and work within can create hurdles in efficiency and consistency. There are tools for large-scale farming to sow evenly and turn soil between seasons, but not for our cubic foot plots. We have tinkered with tools such as converting a stand-up seeder that would normally roll across a field to work hand-held and fit our crates. MF: Where did your initial soil and plants come from? ZP: Before Riverpark Farm launched in July 2011, we got a jump start on our main season crops from greenmarket farmer Fred Wilclow from Wilclow Orchards in New Paltz. He helped get all of our milk crates full of soil and planted our tomatoes, squash, eggplant, okra and cucumbers while we were securing the farm’s first location on a stalled construction site. And since the milk crates are portable, Wilclow was able to transport them in trucks to us as soon as we were ready. We opened mid-season, so it was great to have some green growth to show off right away. At this point, we start all of our own crops from seed in the late winter and early spring and transplant them when the weather is right. MF: What have the chefs been asking you to grow? ZP: One of the main advantages of a kitchen having its own farm is access to products the chefs might not be able to find through their purveyors or at the greenmarkets. So we provide a unique service of supplying the kitchen with all the weird stuff they love. 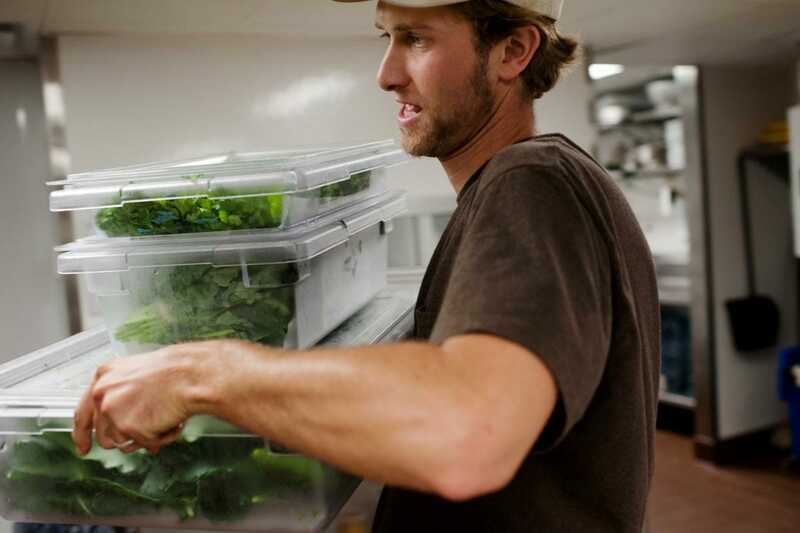 We grow rare, hard-to-find items like salad burnett, rau ram, icicle radish, and lovage. 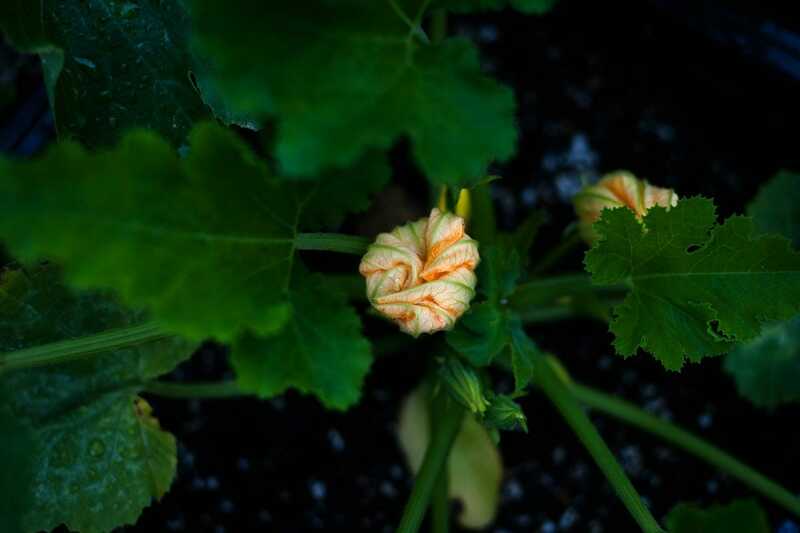 We also grow some crops for atypical uses, like growing nasturtiums packed tight in greenhouse flats for baby leaves, or cilantro grown only for the blossoms. Chef Sisha especially loves bronze fennel, lemon verbena, and a special Chilean pepper called Aji Verde. So we grow all of those in abundance. MF: How often do you meet with chef OrtÁºzar and the other chefs? ZP: We usually have formal planning meetings in January and again in mid-summer. Our January meeting is the big one. We talk about what seeds we want to buy, what infrastructure improvements we want to make, and order our supplies for the year. As for my farm plan, that actually starts with the chefs. I give them seed catalogues, and they bring back a list of crops they’re interested in having that year. It’s then my job to whittle it down based on priority and our ability to grow each crop efficiently in our space. On a daily basis, I check-in with the chefs and sous chefs to see what they’re running out of and to remind them of big harvests we’ve already brought in or will bring in the coming days. MF: You’re a Master Composter. What’s that mean exactly? ZP: In 2010, I completed my Master Composter training through the Brooklyn Botanic Garden. 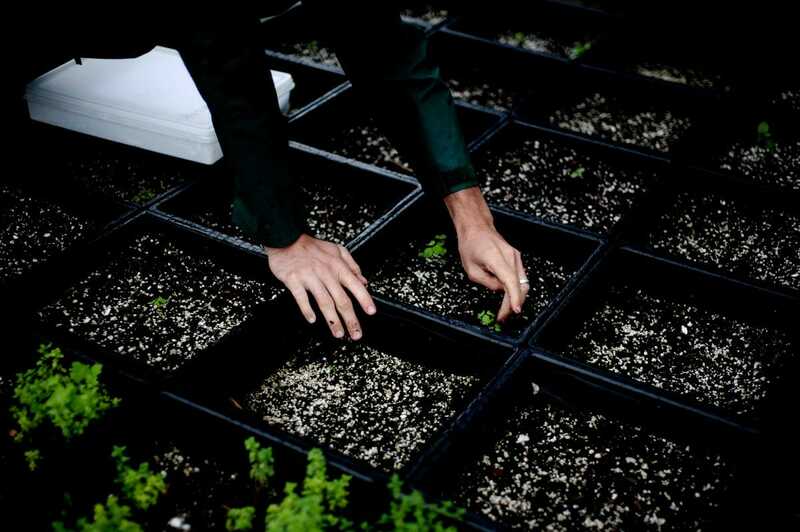 The program sponsored by the Department of Sanitation exists to encourage New Yorkers to teach each other how to keep their organic waste out of landfills and grow healthier soil for city plants. Everyone in my class had to pick a community project. I concentrated on organizing restaurants in Fort Greene to switch their trash service to include composting or composting on site themselves if possible. I was successful in helping one restaurant convert their trash service and another to start composting for themselves. As a cohort, we also helped construct compost bins at community gardens and tabled at community events teaching the public about composting at home. I am probably more proud of this “MC” degree than I am of my MA. MF: Has farm work affected your health? ZP: I went to my doctor last spring for an annual checkup and told her that I was physically exhausted, which to me seemed to be par for the course for a farmer during a busy part of the season. So I was just kind of dealing with it. She asked rhetorically, “So you’re a farmer, you’re 29 years old, and you’re 6’3″? Do you eat?” Her response was simple but surprising. She said, “You should be eating between 4,000 and 5,000 calories per day to compensate. Just like the garden you keep, if you don’t give your body the right inputs you’re not going to have good results.” Ever since then I’ve been gladly taking her advice to eat double the FDA recommended calorie intake. And I’ve felt way better. It just makes sense that in a profession like farming, where you’re pushing your body that hard, you need to put that much more fuel back in to replace. DC: What’s growing right now that you’re most excited about? And what experiments are you working on? ZP: Our Mexican sour gherkin cucumbers and roselle (an edible hibiscus) are taking their sweet time due to our unseasonably cool weather, but are just about to blossom. Both are new crops for this year, so we’ll see how their production does in our environment. I can never get enough of our ground cherries, squash blossoms, or Sun Gold cherry tomatoes. You’ll see me popping those in my mouth around the farm all summer. Sorry, chefs. DC: What are you working on beyond the farm? ZP: I started Rooftop Ready Seeds in 2010 to supply city gardeners with vegetable and herb seeds that are more suitable for their unique growing conditions — plants are urban-heat-island-affected, exposed to heavy winds and extreme sun exposure on rooftops, and usually confined to containers. It’s a small company and is definitely a side project, but I’m growing it steadily every year. I had 27 varieties this year and will have closer to 50 for 2014. I sell seed in my online store and in local garden stores — two in Brooklyn and one in Harlem.